Hedy Lamarr in 1948. Courtesy of Wikipedia. Actress Hedy Lamarr (1914-2000) would have turned 101 on November 9th. In honor of her birthday, Google launched an animated Google Doodle of her life story—just one of many tributes to Lamarr that have appeared over the past several years. Numerous books and articles have talked about Lamarr's fascinating life—her scandalous debut in the Czech film Ecstasy, her discovery (and renaming) by Louis B. Mayer, her persona as the most glamorous woman of Hollywood's Golden Age, her six marriages (and divorces), and her denouement into obscurity in her later years. Those biographical details, however, typically serve only as the backdrop for these authors' main story: Hedy Lamarr was an inventor. She was born Hedwig Eva Maria Kiesler in Vienna, Austria in 1914. Her father was the director of a bank and her Hungarian mother was a concert pianist. Hedwig took ballet and piano lessons as a child, and then studied acting under director Max Reinhardt in Berlin. In 1933, the Austrian munitions dealer Friedrich “Fritz” Mandl saw Hedwig perform in the play Sissy in Vienna and was smitten; they were married later that year. Cracks soon appeared in the marriage. Although Hedy had originally been attracted to Fritz’s intelligence and strength, she soon learned that his need for total control extended to her as well. As her independence and sense of self-worth slipped away, she also grew increasingly wary of Fritz’s right-wing politics. She broke away from Mandl in 1937 and went to England. A chance encounter with Louis B. Mayer (the second "M" in MGM) got her a ticket to Hollywood, where she starred in a roster of films including Algiers (1938), White Cargo (1942), Tortilla Flat (1942), and Samson and Delilah (1949). Her performances often received mixed reviews, but the testaments to her beauty and allure were unanimous. During a small dinner party in 1940 at the home of actress Janet Gaynor and her husband, the legendary costume designer Gilbert Adrian, Lamarr met a kindred inventive spirit in George Antheil. 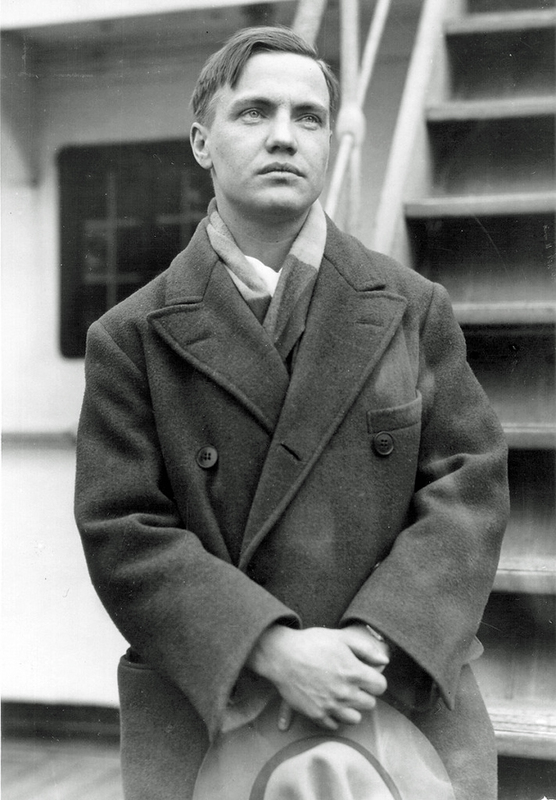 George Antheil. Courtesy of Wikimedia Commons. The Trenton, New Jersey native was known for his writing, his film scores, and especially his avant garde music compositions, but he was also an inventor. He received French patent 578.777 in 1924 for an “Appareil et papier pour l’inscription de la musique”—an electrical apparatus that made contact with a piano keyboard and recorded the notes played on a moving roll of paper, reminiscent of 19th-century telegraph registers and player pianos. She didn’t leave Hollywood; instead, she and Antheil began work on one of Lamarr’s invention ideas—a radio-guided torpedo with synchronized anti-jamming frequency hopping. Antheil had experience with making machines talk to each other—or, at least, trying to do so. His infamous, ambitious testament to the Machine Age, Ballet mécanique. was originally scored for 16 synchronized player pianos, “accompanied by two grand pianos played by musicians, as well as three xylophones, four bass drums, a gong, three airplane propellers, seven electric bells, and a siren.” (5) Unfortunately, the technology needed to accomplish the feat of keeping 16 player pianos in sync, connected by cables to a master keyboard, didn’t exist yet. Antheil rescored the piece with fewer pianos for its riot-inducing debut in Paris in 1926. The knowledge gained through Ballet mécanique and other synchronized compositions was relevant to Antheil and Lamarr’s quest to create a method of communicating frequency changes between a ship or an airplane and a torpedo so that both the transmitter and receiver hopped to a new frequency together. The two inventors sent their rudimentary ideas and sketches to the National Inventors’ Council, a clearinghouse for military and defense inventions submitted by civilians, at the end of 1940. With favorable feedback from the Council, Lamarr and Antheil continued to develop their invention. Antheil saw an analogy to player pianos in the introduction of paper tapes that carried the frequency-change and timing instructions. Both transmitter and receiver hopped simultaneously at short, random time intervals. Any attempts at jamming the signal would be short-lived since the frequency would change so often and so rapidly. Antheil and Lamarr specified up to 88 frequency changes—a nod to the 88 keys on a piano. Detail of of the paper tape in Lamarr and Antheil's patent for a "Secret Communication System." The patent was issued to Antheil and Hedwig Kiesler Markey, reflecting her second marriage to screenwriter Gene Markey. In June 1941, Lamarr and Antheil submitted their patent application for a “Secret Communication System,” which was awarded U.S. Patent No. 2,292,387 in August 1942. The patent clearly shows the paper tape in one of the drawings and states: “[W]e contemplate employing records of the type used for many years in player pianos . . . .” The patent also describes a clockwork mechanism that could be used to ensure that the transmitter and receiver tapes started at the exact same moment; any deviation from a simultaneous start would have prevented synchronization. In addition to tape-driven frequency hopping, the patent outlines a method for sending false signals that further enhanced the anti-jamming properties. With the rejection of their invention, Antheil and Lamarr moved on. He went back to composing music. She used her celebrity to sell war bonds. Their patent, owned by the U.S. government and unused by the Navy, expired in 1959—the same year that George Antheil died. Since Lamarr and Antheil’s groundbreaking work in frequency hopping, many other applications of spread spectrum technology—the broader term for wireless communications using variable signals—have arisen, including Bluetooth, wi-fi, and GPS. There are many remarkable aspects to the life of Hedy Lamarr—the stuff of Hollywood biopics—but her collaboration with George Antheil is perhaps the most interesting. Lamarr defied movie star stereotypes. Her partnership with another artist who didn't match the public's expectations offers insight into her determination, her problem-solving abilities, and her openness to risk-taking. She could have had a glamorous, if vacuous, life, but instead she chose to cross boundaries with Antheil, finding analogies between music and engineering—between art and technology in a broad sense—that fulfilled not only her impulse to aid the war effort in her new homeland, but her need to think, to do, to make, to matter. For Hedy Lamarr, standing around and looking stupid was never an option. Author's note: This blog is dedicated to my mother, an avid movie fan until the day she passed away last month. She instilled her love of the silver screen in me and I especially miss our conversations about the films of Hollywood's Golden Age. Today would have been her 94th birthday. I hope they have TCM in heaven, Mom. Richard Rhodes, Hedy's Folly (New York: Doubleday, 2011): 28-29. Gilbert King, “Team Hollywood’s Secret Weapon,” Smithsonian.com, 23 May 2012. Paul D. Lehrman, “Blast from the Past,” Wired.com. 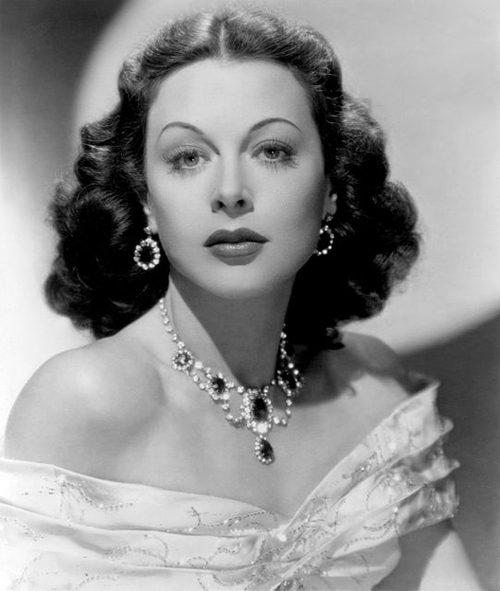 Jennifer Ouellette, "Hop, Skip and a Jump: Remembering Hedy Lamar," Scientific American, January 9, 2012.